Beautiful Neches Mountain Ranch is located just outside of the quaint little town of Neches, TX, which is located between Palestine and Tyler, TX. The terrain in the area offers rolling hills, woods, pasture, and numerous spring fed creeks. Comprised of 664 acres of some of the best land in Anderson County, Neches Mountain Ranch includes a mile of frontage on FM 2267. The focal point of the ranch is the breathtaking 360 degree view from the mountain top. At 600 feet, it offers one of the highest elevations in the entire county. The mountain is cleared of underbrush, and provides an endless panorama of the surrounding countryside, making it a magnificent site to enjoy the scenery. The entire perimeter of the ranch has recently been high fenced with attention being paid to every detail concerning water gaps and creek crossings. There has been an extensive amount of work done on the ranch: soft surface roads, installation of creek crossings and bridges, underbrushing the hillsides, construction of multiple lakes and ponds, creek enhancements, and various other projects that have laid the foundation for a true "showplace" hunting ranch. 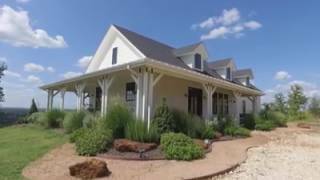 The Neches Mountain ranch house, completed in 2015, showcases the breath taking views that epitomize the property. With just under 3000 of living area, 3 bedrooms, 3 baths and an open concept, the finishes are second to none. Reclaimed barn wood from Colorado, fixtures from Restoration Hardware and high end appliances give a modern twist to the rustic mountain lodge design. The attention to detail and awareness of the surrounding views have created a true masterpiece allowing a full enjoyment of the ranch. Other improvements include a metal barn on a slab, top notch tower blinds, free choice protein feeders, spin cast feeders, a deep water well, and low fence cross fencing for cattle rotation and grazing. Neches Mountain Ranch, a showplace property ready for recreation and enjoyment, all that&apos;s missing is you. $3,500,000. Contact Tyson for more information at 979-229-8710.